I’m very excited to be able to share this pattern with you. 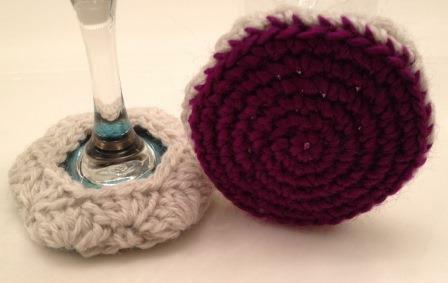 In my previous post, I’m in Love with the Shell Stitch, I showed you a wine glass coaster/cozy that I designed and stitched up all on my own! Today, I’ll be sharing the pattern. But first: for anyone who may not be familiar with what a shell stitch is, the shell stitch (also known as the ‘fan stitch’) consists of multiple stitches being crocheted into the same stitch. Because you have multiple stitches sharing the same space, you end up with a cluster that resembles a shell, or a fan. 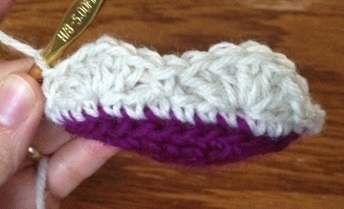 In my pattern, I use two different size shells, a 5 double crochet shell and a 3 double crochet shell. I like the idea of two colors in each cozy, each base (the first six rows) has its own unique color but the top part with the shells (rows seven and eight) are the same with all cozies. 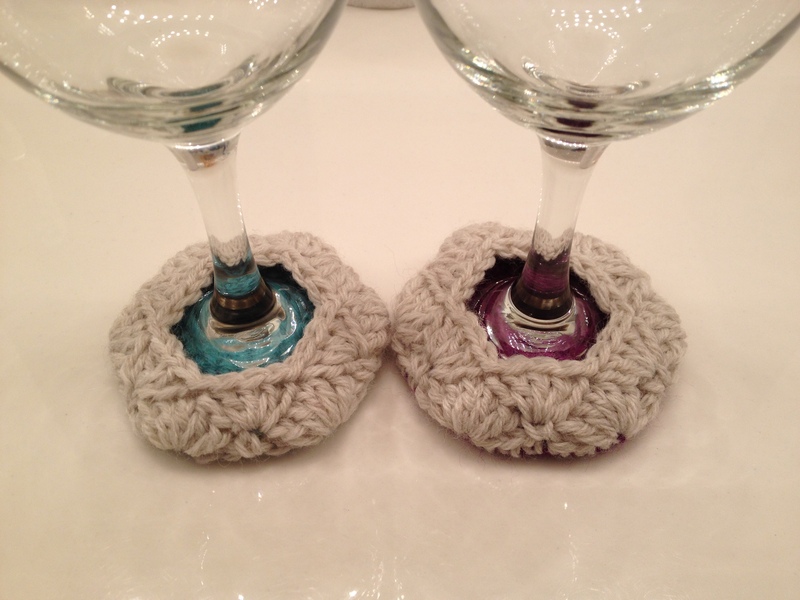 The same top color helps create a uniform look among all the cozies but the distinct base shows through the stem and allows for just enough distinction to help everyone keep track of their wine glass. 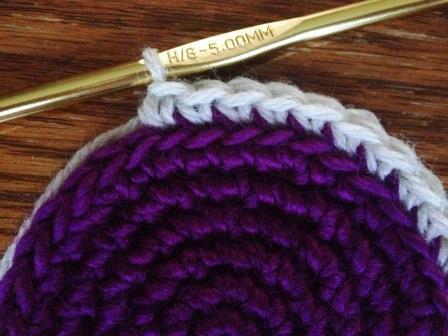 A 5 double crochet shell will be denoted as 5dcsh; a 3 double crochet shell will be denoted as 3dcsh. The ‘chain 1’ at the start of the first seven rows will not count as the first stitch of each row; but it will for rows 8 and 9. Row 9: chain 2, counts as first dc. Dc in same joining stitch. (Skip two stitches, sl st in next stitch, skip two stitches, 3dcsh in next stitch), repeat 4 more times. Skip two stitches, sl st in next stitch, skip two stitches, 1 dc in same stitch as first dc. Join with a sl st to first dc. Cut tail and weave in ends. This is my first attempt at writing a pattern so please let me know if any of the instructions seem out of sorts. Sharing is caring but stealing is not nice. Feel free to make dozens for yourself or to gift but please give me credit by including the link back to my pattern if you pin or share online.